Randolph Scott, Barbara Britton, George Gabby Hayes, George Cleveland, Lon Chaney Jr, Russell Simpson, Irving Bacon. 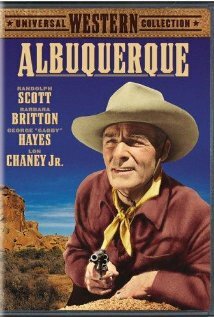 Albuquerque is one of Randolph Scott’s many westerns, making westerns solely from the mid-1940s to 1962. This one is directed by Ray Enright also directed Trail Street and Coroner Creek at this time. Randolph Scott rides into town hoping for a job with his uncle in freight hauling, teaming up with a group of honest people who are being put out of business by Scots uncle, George Cleveland as an avaricious villain. Scott confronts his uncle, teams are with the honourable types which leads to Western action and gunfights. Lon Chaney Jr is a graph film, George Gabby Hayes is enjoyable in a less than typical role. This is quite a routine western. 1. A Randolph Scott Western? Plot, type, a heroics? 2. The Western tradition in 1948? Conventions? 3. New Mexico, the city of Albuquerque, offices, the mines, companies? The jail? Action, the hold-up, the 12 mule carriage? Musical score? 4. The presence of George Gabby Hayes, his appearance, jokes, way with words, old-timer? Teaming up with Cole, with the mules, the final confrontation and shootout? 5. The pioneers in New Mexico, coming from the east, from Texas? The Hispanics and their fiestas, religious services? 6. The initial hold-up, the shooting, the robbing of the money? The role of the sheriff, John Armin, the men going to the saloon, Juke and Cole finding them, the confrontation, the killer going to jail? Armin and his seeming to agree, arranging for the sheriff to kill him? 7. Cole, the stagecoach, the friendship with Celia, Myrtle and her prattle? The deaths? The robbery? 8. Cole, nephew of Armin, the bad reputation, Ted and his reaction? Cole wanting a job from his uncle? Going to see him? The discovery of the truth about him? 9. Armin’s henchman, killer, confronting Cole, their fight, cowardice, his death? Cole, retrieving the $10,000, his hold over his uncle? Ted and his animosity, change of heart? Cole investing in the company? The success? Letty, her arrival, called in by Armin, helping with the work, falling in love with Ted? Celia and her love for Cole? 10. Sabotage, Ted being shot in the leg? His love for Letty, disillusionment? The fire, Cole accused, going to court, the testimony against him, Myrtle and her witness to his being with Letty? Celia upset? His being in jail, Myrtle’s visit? Going on the Stagecoach or not? 11. The explosion in the mines? Cole and his discussions with the managers, with Huggins? The contract for 12 mule carriages? The dangers? 12. The trip down the mountain, the lack of a brake? Cole managing? Arrival in town, Armin calling in the gang? Letty and her confrontation with Armin? 13. The shootout, the men undercover in the wagon? Armin’s death? 14. Prosperity to the company, and happy weddings?